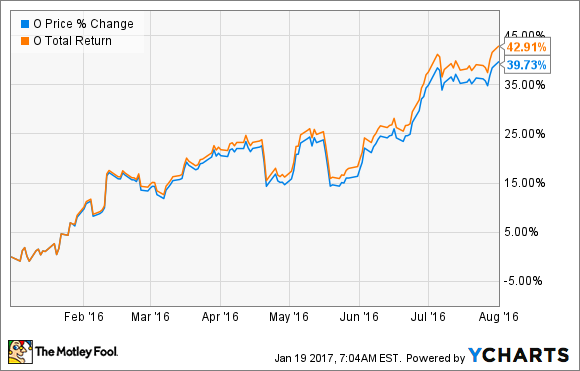 Will 2017 Be Realty Income Corporation's Best Year Yet? 2016 was a pretty solid year for Realty Income. Could 2017 be even better? Retail REIT Realty Income (NYSE:O) gave investors several reasons to smile in 2016. Just to name a few, the stock's dividend grew by about 6% throughout the year, the company acquired twice as many properties as it expected, and at record-low costs of capital. Realty Income's 8.6% total return in 2016 was fairly strong. Will 2017 bring even better returns for shareholders -- maybe even the company's best? Walgreens is among Realty Income's largest tenants. Image source: The Motley Fool. Realty Income delivered remarkable returns throughout the first half of 2016, or more specifically, the first seven months. The company's stock soared by 40%, and including dividends, shareholders were sitting on a total return of nearly 43% -- in just seven months. This type of performance wasn't unique to Realty Income. Most REITs did extremely well during this period. The persistently low interest environment propped up the share prices of REITs and created extremely favorable conditions for acquiring new properties, which I'll discuss shortly. But, what happened after July? In August, though, the party abruptly ended. Economic data was increasingly pointing toward interest rate hikes, and fixed-income yields started to climb in anticipation. As you can see in this chart, interest rates and REIT prices moved opposite of one another during the latter five months of the year. Rising interest rates are bad for REITs in a few ways. For one thing, when rates rise, investors expect higher yields from their stock investments to compensate for the risk. Think of it this way: If a 30-year Treasury bond pays 3%, and a REIT pays 5%, in an investor's mind, it may be worth taking on the additional risk of holding a REIT. If the Treasury's yield shoots up to 5%, the risk of holding a REIT seems less worth it, so REIT share prices fall to produce bigger dividend yields. Because of this downward pressure, it makes acquiring new properties more expensive, even for REITs like Realty Income, which aren't too reliant on debt. Realty Income prefers to finance properties by issuing new shares, and when the share price falls, it needs to issue more new shares to acquire the same amount of new properties. The company has maintained its investment-grade credit ratings (Baa1/BBB+). Furthermore, nearly half of the company's rental income comes from investment-grade tenants. Realty Income's properties are 98.3% occupied and have never fallen below 96% no matter what the economy or interest rates were doing. The company's average lease has more than 11 years left, which should minimize turnover and maintain a consistent income stream. Most of Realty Income's debt, which makes up less than a quarter of its capitalization, is fixed-rate, at an average interest rate of 4.1%. Same-store rent growth has consistently averaged about 1.3% per year, and releasing activity recaptures more than 100% of prior rent once leases expire. Realty Income raised its dividend 6% year over year for 2017, and it has increased its dividend 90 times in its 23-year NYSE-listed history with no dividend cuts. In fact, Realty Income increased its dividend by 2.7% in 2009 while the median REIT cut its dividend by 25%. 2017: The best year yet? Despite a big dividend raise early in the year and a strong year for acquisitions in 2016, I don't think Realty Income will have a great year in 2017 -- as far as the stock is concerned. Don't get me wrong, I think Realty Income's properties will stay almost fully occupied, the company will make some acquisitions, and the dividend will probably be increased several more times throughout the year. 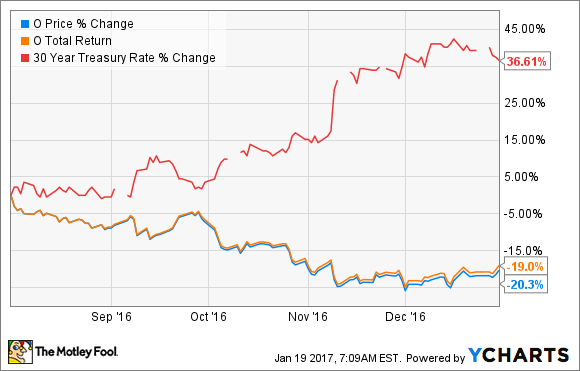 However, with interest rates projected to increase a few times in 2017, I think there will be significant pressure on Realty Income's stock price as the year goes on as investors will start expecting larger yields from their investments. Don't get me wrong -- Realty Income has performed well during rising-rate periods in the past, and I think it will do the same again. Even so, Realty Income has had some pretty good years throughout its history. In fact, its average total return is nearly 18% per year. With the prospect of interest rates rising for the next several years, I just don't see 2017 being anywhere close to the best year yet for this leading retail REIT.